AutoHideMouseCursor has been created as a portable application, the INI file (configuration file) is created in the working directory as a hidden file. and the AutoHideMouseCursor_x64.exe the AutoHideMouseCursor_x64.ini. The ini is a hidden file: ... Show hidden files and folders in Windows 10, how to? Tip: ... Open the location of an Program in Windows-10! (Image-1) The settings are apparently stored in the ini-File! AutoHideMouseCursor - FAQ-1: The settings are apparently stored in the registry, right? 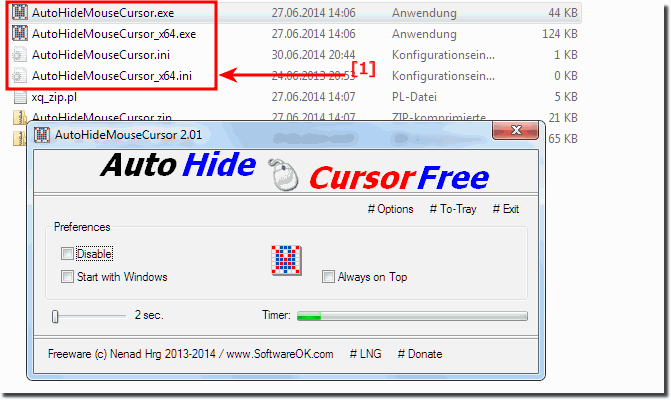 At Windows 7 or Windows 10, there are different procedures for hiding the mouse cursor, which can be selected freely from AutoHideMouseCursor version 2.25. Hiding the Mouse - Classic and New Strategy (Windows, 10, 8.1, ...)?